Up until a couple of years ago, I had Netvibes as the start page on all my browsers and PCs. It was my personal dashboard to all the RSS feeds I was following, with a few email and task list widgets thrown in for measures. Back when blogs and feeds still had all the buzz that nowadays belongs to social media and networks, it felt like you had all the world’s relevant information at your fingertips, when clicking through tabs filled with the very latest posts from hand picked sources. Effectively it was as “real-time” as the web could be viewed in. Then came Twitter and all the TweetDeck style clients, which claimed the “real-time” and “dashboard” titles respectively. Suddenly the old RSS reader applications started to feel like a graveyard of old and irrelevant news, when all the big stories and best articles seemed to flow from your tweeps via URL shorteners within hours or minutes from publishing. All this meant that browsing through your RSS feeds became more of a chore that you had to do every now and then, a bit like keeping your inbox clean. At the same time I had also abandoned Netvibes due to its continuous technical glitches and moved over to the simple choice, i.e. Google Reader. We all know Google is great at productivity apps for information management utility services, so this further played down the status of RSS feeds for me. I started to feel increasingly unbalanced in this situation where my online media diet had transformed from an á la carte meal to a series of fast food pick ups. Sure, I was getting absolutely great links through Twitter, but my ability to focus on following any single topic was rapidly eroding as the gap between RSS feeds and real-time feeds was growing. One night when sitting on a train without any headphones or books with me, I spent a couple of hours on gReader for Android and went through the unread items in by Google Reader queue. When I reached my destination, I had started to better understand what the world of information around me looked like and how I should change my reading habits. First, the concept of “unread items” is a relic from working with email clients, therefore we should get rid of in the world of feeds and tweets. Trying to use this metaphor there is like saying “you have 6,000,000 unread sites in the internet”. Only messages from a person to a person should carry the assumption that you have the duty to read through the item. This is why spam in your inbox makes you so angry, whereas a banner on a site can just be gracefully ignored, even if they both would spend exactly the same amount of time in your line of sight. Second, you shouldn’t read all RSS’s with a single application. Yes, technically you could have just one great tool for managing all the bits that are distributed through the RSS format, but you don’t do both work and personal email through the same inbox either, do you? (At least I hope you don’t?) There are two main types of content that I have on my list of RSS subscriptions: posts and news. What I call posts is the traditional blogging kind of content that is written and published by people who don’t write this content for a living (they may get paid for it, but it’s not their main task). Then we have the news content, which is the traditional newspaper style articles that get published by either old or new media houses, be it WSJ or TechCrunch. Treating these two separately is what I believe to be the key to resolving my RSS anxiety. Any feed that regularly publishes more than 2 items per day should be categorized as news. No matter how remarkable the content might be, it should be consumed differently. Just like you don’t read through each and every article in the morning newspaper (if you still subscribe to a physical paper, that is), the news feeds are meant to be glanced at from a high level and then read selectively. Whereas if you follow a blog that consistently delivers good analysis or entertaining stories, reading through each and every post at least with some level of attention may well be justified. Getting caught in reading “the whole newspaper” is all too easy if the delivery channel and presentation of the content is identical to posts. Instead of searching for a tool that can separate and categorize the content just the way you want it, do the easy thing: split the feeds into two totally separate RSS readers. I went through my old Netvibes dashboards one by one, moving subscriptions to either Google Reader, a brand new dashboard in Netvibes or just deleting them (wish I had even more courage with the last category). Similarly, anything that was filling up my Google Reader in a newsfeed style got moved to Netvibes. When it came to reviewing some of the older blogs that had become less active, I also checked to see if the writer was nowadays in Twitter and if they were posting any content of interest over there. The same kind of quantity metrics apply to tweets as well, but that’s a whole different post I need to write later. So far I must say I feel considerably more at ease with the feeds and other information sources around me. Let’s see if the system works on a longer term, or until new channels come along. If there’s a lesson to be learned from this, I guess it’s all about not searching for the one ultimate hammer but rather selecting the right tool for each job. 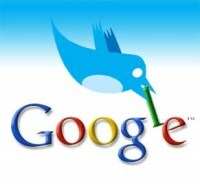 Tagged with blogs, feeds, Google, Netvibes, RSS, TweetDeck, Twitter. Nice article, I can also see problem with that. I used Google Reader before and then I went to Feedly, which pulls Google Reader feeds and has integrated sharing. 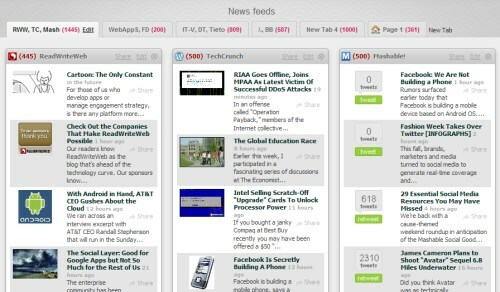 I’ve also considered Netvibes, maybe I will use it along with Google Reader/Feedly. But I’d like to have one master app for that like Tweetdeck to manage everything, including feeds.